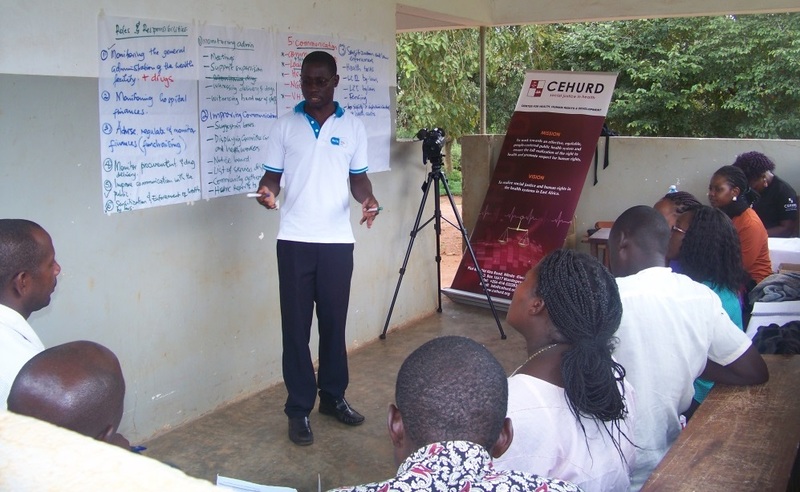 During this quarter, CEHURD has engaged with Health Unit Management Committees (HUMCs) in Kiboga and Kyankwanzi districts. This has been one as part of a three year participatory action research project titled “Health System Governance: Community Participation as a Key Strategy for Realizing the Right to Health.” This engagement entailed capacity building and community dialogues with members of HUMCs of Kikoolimbo Health Center in Kyankwanzi and Nyamiringa Health Center in Kiboga. Although the project engaged various stake holders in the decentralized health system, there has been a specific focus on Health Unit Management Committees (HUMCs) a structure establish by Ministry of Health to among others promote community participation the decentralized health system. Community participation has been argued as one of the strategies that can be utilized in realizing the right to health given the role it can play in promoting accountability of duty bearers to right’s holders and improving the effectiveness and sustainability of health interventions, programs and services in various ways. Community participation means that the community is no longer a passive recipient of health care, but an active participant in the creation of a health care system that serves their specific needs. This action research has affirmed the role that HUMCs can play in facilitating health service accountability, since they are supposed to act as the interface between communities and points of care. It also revealed that challenges of these structures including; role confusion in what committee members’ duty and the lack of knowledge among community members on the role and existence of such structures. Having identified these challenges, CEHURD team met with the members of these management committees, took them through a various process to enable them understand their roles and responsibilities during which they were empowered and organized a community dialogue with the communities which the health center serves. These community dialogues were utilized as an avenue for community members to understand the role of HUMCs and also air their challenges, improve on communication between service providers and patients and after work together on strategies to address the challenges. This action research has reaffirmed that Civil Society can indeed play a role holding health services accountable and creating a sense of community ownership of health services (London, 2007). It has the potential to strengthen trust and good relationships between patients and health workers. It allows communities to participate in defining models of care and resource allocation in health and for communities to become involved in dealing with the social and economic determinants of health. We acknowledge the role and contribution of Veronica Masanja (Nyamirina Health Facility in-charge) who took part in the re-search exchange visit during which best practices and models were shared, members of the two HUMCs who dedicated time to this process, District Health Officers of the two districts, our collaborating partners from the Learning Network for Health and Human Rights of the School of Public Health and Family Medicine at the University of Cape Town (UCT) and support from the International Development and Research Center(IDRC), Canada.